2. Dump server information like : db name, sid, real internet ip address, user list, user hash and so on. Maybe you could say it cannot execute multi-sql through a single query. Don’t worry. 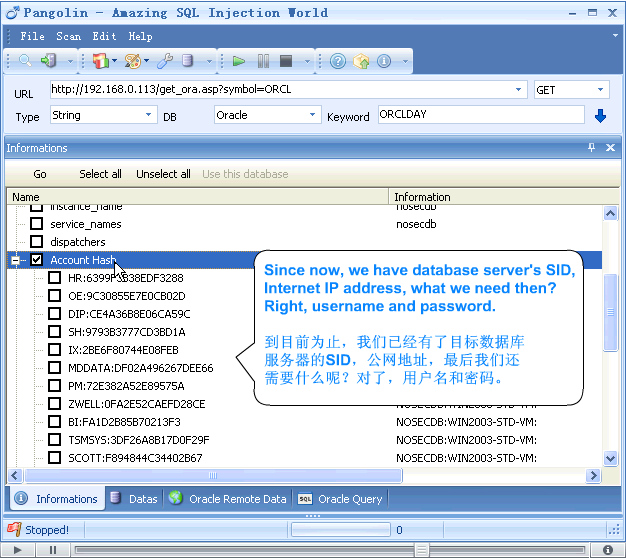 There is a demo at http://down2.nosec.org/swf/pangolin_oracle.html, you can watch it and learn a lot of things about Oracle sql injection. ==>usage of utl_http to get additional data. A faster way getting all results from multiple queries in a single query is described in a blog entry here. utl_http is often revoked from public for security reasons. The usage of httpuritype is normally more reliable from the security perspective. ==> via sys_context function. That’s standard Oracle functionality. Nothing special. ==> Matrixay is doing this since several years. Maybe you could say it cannot execute multi-sql through a single query. ==> Stacked queries are not possible in Oracle. Correct me if I’m wrong. You are using a PL/SQL Injection vulnerability in a SQL function. This is a small but important difference. This entry was posted on Montag, April 20th, 2009 at 15:11 and is filed under software, SQL Injection, Tools. You can follow any responses to this entry through the RSS 2.0 feed. You can leave a response, or trackback from your own site.